Tadmuck Swamp is one of Westford’s largest wetlands, stretching from Main Street on the north to south of Littleton Road (Rt. 110), and from Tadmuck Road on the west to Chamberlain Road on the east. The area features Mystery Spring, which has been a favorite local “watering hole” for over 150 years, attractive woodlands, and fascinating glacial terrain. All these natural features are readily accessible thanks to a trail network which you can enter from Tadmuck Road, Dana Drive, or Buckboard Drive, as shown on the accompanying map. See also The Long Trail for connections to Buckboard Drive and Cider Mill Pond. 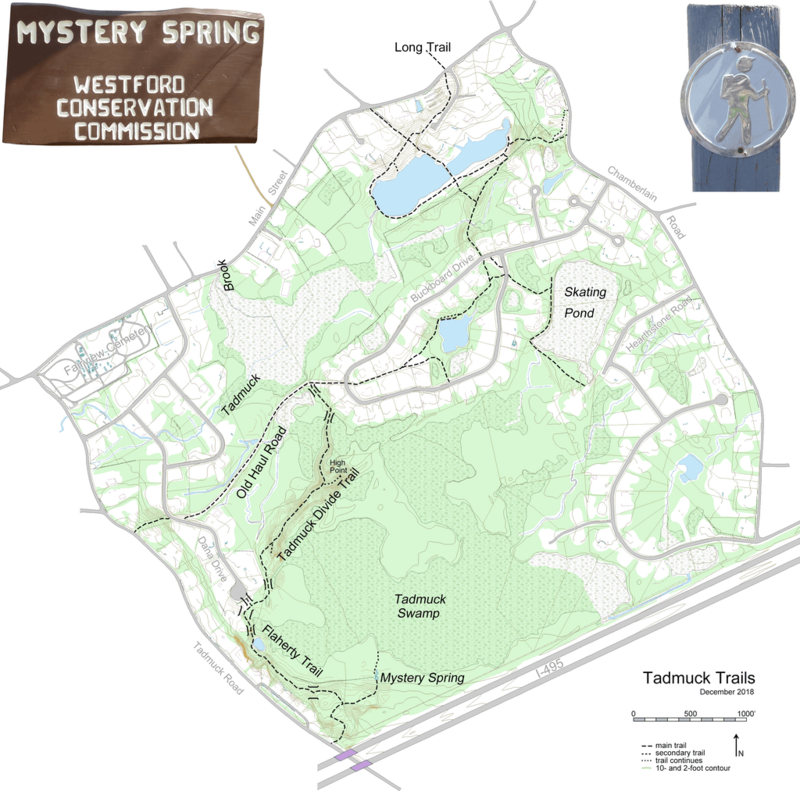 Mystery Spring Trail (0.2 miles long) starts at Tadmuck Road immediately north of the Interstate 495 bridge. A large wooden sign, installed in April 2002 and recently refurbished, marks the entrance to the property. Avoiding the poison ivy near the entrance, take a left turn almost right away, then follow the trail which is outlined by logs and marked by white blazes on trees. One-tenth of a mile from the road, the Flaherty Trail leaves left for Dana Drive. After another one-tenth mile, the Mystery Spring Trail ends at the spring, which was called “Mysterious Spring” on the 1855 Town Map prepared by Edward Symmes. Emerging from a cleft in a rock, these waters would once have been a refreshing delight to people and animals alike, but please do not consume them today. Perhaps you will see one of the spring’s resident frogs, which tarry at the spring’s mouth at certain times of year. The spring and nearby lands to the south were bequeathed to the Town by Oscar Spaulding in 1943. The Flaherty Trail (0.3 miles long) runs from the Mystery Spring Trail to the Dana Drive cul-de-sac. The trail features pleasant woodlands, old stone walls, and a secluded pond. Ponder this water body’s origin as you make your way around it on a side path. Be prepared for a muddy area along the trail near Dana Drive. This trail was constructed in 2001 by Joe Flaherty, developer of nearby Orion Way, and was named by the Westford Conservation Trust in his honor. Mr. Flaherty was the 2001 recipient of the Conservation Trustee Award, because of his accomplishments of preserving environmentally-sensitive areas and open space in his developments. The Tadmuck Divide Trail (0.5 miles long) provides a delightful scramble over glaciated terrain, fun for children and nimble adults alike. The sinuous ridge over which you walk may be an “esker”, the remains of the gravel bed of a stream that once ran under the glacier that covered our area more than 10,000 years ago. The rounded cobbles and boulders of the ancient streambed are evident in the footpath. The trail extends from the Dana Drive cul-de-sac, to a point on the Old Haul Road near Buckboard Drive. There is one muddy area near Buckboard Drive. North of the trail, precipitation drains to Tadmuck Brook, which conveys water north to Stony Brook. South of the trail, precipitation drains to Beaver Brook, which flows south then east through Chelmsford Center, discharging eventually into River Meadow Brook and the Concord River. From the trail’s high point atop the esker, there is a surprising solitude, as the forest screens the sight and sound of nearby human habitation. Unmarked paths lead over branching eskers from the trail’s high point – take time to explore other parts of the glacier’s gift! The Old Haul Road (0.5 miles long) was once part of a gravel road network providing access between Tadmuck Road and Chamberlain Road. Gravel roads in the general area appear on all six editions of the U.S. Geological Survey topographic maps of Westford published from 1941 to 1987, servicing sand and gravel pits that once operated here. No longer intended for vehicles, the road now provides a wide, easy walk between Buckboard Drive and Dana Drive. From Buckboard Drive, the old road begins between houses 37 and 39; shortly before some big boulders blocking vehicular access, the Tadmuck Divide Trail leaves left into the woods behind a stone wall. The Old Haul Road crosses Dana Drive and extends a short distance up the hill to Tadmuck Road, where the old road’s entrance is still visible. You can enter from Tadmuck Road, Dana Drive, or Buckboard Drive, as shown on the accompanying map.